From snow and ice, to strong winds and extreme cold, severe winter weather poses a diverse set of risks to residents. The Missouri Department of Conservation (MDC) reminds Missourians to exercise caution in dealing with the effects of icy weather. When storms damage trees, clean-up and recovery can seem bewildering. Some injured trees can be trimmed to maintain their health and value to homeowners. Others should be removed. Knowing what repairs to make, how to make them, and how to avoid paying for unneeded services can help keep injury – both physical and financial – at a minimum. Be aware of utility lines and hazardous overhanging limbs. Alert your electricity provider immediately and allow experts to assess the danger. Remove trees or limbs that have fallen on your home or are blocking access to your residence. Also, look for any hanging limbs in trees that could drop on your home. Know your skill level and do not take on more than you can safely accomplish yourself. Any remaining tree damage can wait until the immediate crisis has passed. As long as there isn’t a safety risk, take your time to assess the damage and make decisions on which trees to cut and which ones to save. If a tree does not present a hazard, take the time to ensure it gets proper care and make a final decision about it in a few weeks or months. Before beginning any tree work, determine whether your insurance policy covers tree work. Many policies will cover at least part of the cost of tree removal if some structural damage has occurred. Determine whether damaged trees need pruning or complete removal. If a valuable tree appears to be a borderline case, resist the temptation to simply cut the tree down and be done with it. After carefully pruning broken branches, give the tree time to recover. Often, new foliage will return the tree to its natural beauty. If not, the decision to remove the tree can always be made later. Being listed in the directory doesn’t guarantee that companies will do good work, but means that they are locally established and should be easier to track down later if something goes wrong. Ask for proof of certification and of membership in professional organizations such as ISA. Ask for proof of worker’s compensation and liability insurance, as well as local references. Good arborists are proud of their work and can provide a list of past clients. Do not accept “take-it-now” deals. The person offering these deals may pressure you into doing something you will regret later. Good arborists do not recommend topping. 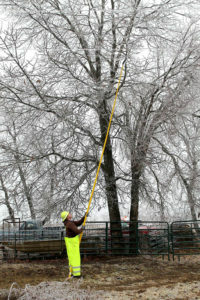 Conscientious arborists also will not use climbing spikes unless the tree is to be removed or someone is hurt. These practices damage trees unnecessarily. Trees are amazingly resilient and often possess the ability to recover from severe conditions over time. For more information, contact your local MDC office, or click here.